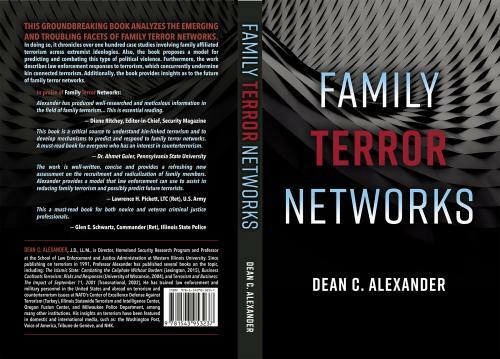 MACOMB, IL - - A new book authored by Western Illinois University Homeland Security Professor Dean C. Alexander addresses the aspects of family terror networks, their implications and countering this increasingly prominent facet of international terrorism. "Family Terror Networks," the first monograph of its kind, discusses the characteristics of family terror networks and chronicles case studies involving them across ideologies. It proposed a model for predicting family terror networks and its utility in combating this type of political violence. Additionally, an analysis of the 118 case studies of family connected terrorism involving 138 examples of kin relationships (e.g., brothers, husbands/wives and fathers/sons) is shared. "Particularly noteworthy, the 138 family ties discussed in the cases involved fairly equal amounts of husbands/wives (43/138 or 31 percent) and brothers (36/138 or 26 percent). As such, these case studies suggest that family affiliated terrorism occurs most readily in husbands/wives and brothers," said Alexander. Overwhelmingly, jihadism was the ideology connected to the 118 instances of families affiliated with terrorism that were reviewed. This type of extremism was found in 87 percent of the cases with other precepts occurring comparatively fairly rarely (13 percent). Among the non-jihadists associated with kin terrorism, they were affiliated with mostly right-wing extremism (e.g., sovereign citizens, militia and white supremacy). The study also describes law enforcement responses to terrorism, which concurrently undermine kin connected terrorism. Alexander, who is also the director of the WIU School of LEJA's Homeland Security Research Program (HSRP), said the book's subject material ties in with his research and his instruction at Western. "WIU's HSRP addresses domestic and international terror threats and their implications. The threats posed by family terror networks to the global community are significant and long lasting, necessitating expansive and far-reaching responses at home and abroad," he noted. As a faculty member in Western's internationally-known School of Law Enforcement and Justice Administration, Alexander integrates his research and insights into his courses on terrorism and law enforcement, terror finance and the legal aspects of homeland security. WIU's homeland security minor is among the largest at the University with over 190 students. Since publishing on terrorism in 1991, Alexander has published several books on the topic, including: "The Islamic State: Combating the Caliphate Without Borders" (Lexington, 2015), "Business Confronts Terrorism: Risks and Responses" (University of Wisconsin, 2004) and "Terrorism and Business: The Impact of September 11, 2001" (Transnational, 2002). He has trained law enforcement and military personnel in the United States and abroad on terrorism and counterterrorism issues at NATO's Center of Excellence Defense Against Terrorism (Turkey), Illinois Statewide Terrorism and Intelligence Center, Oregon Fusion Center, and Milwaukee Police Department, among many other institutions. His insights on terrorism have been featured in domestic and international media, among them: the "Washington Post," "Voice of America," "Tribune de Genève," and "NHK." For more information on the HSRP or "Family Terror Networks," email DC-Alexander@wiu.edu. To learn more about Western's School of Law Enforcement and Justice Administration, visit wiu.edu/leja.